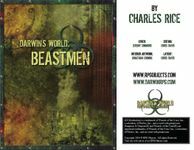 Welcome to Beastmen, a book bringing the wild to your Darwin’s World game. Beastmen introduces a new type of PC race, the Bestial Genotype. A Bestial Genotype is a race that strongly resembles an animal species from before the Fall. Whether Beastmen are animals that have gained sentience, or humans who have taken on the traits of animals in the struggle to survive or even the result of some bizarre genetic experiment carried out after the Fall is up to you. To represent the abilities and mentality of the animal world, Beastmen also features a number of new mutations, defects and mutant feats. Finally a new epic class, the Alpha is presented for those who want to command packs of animals.